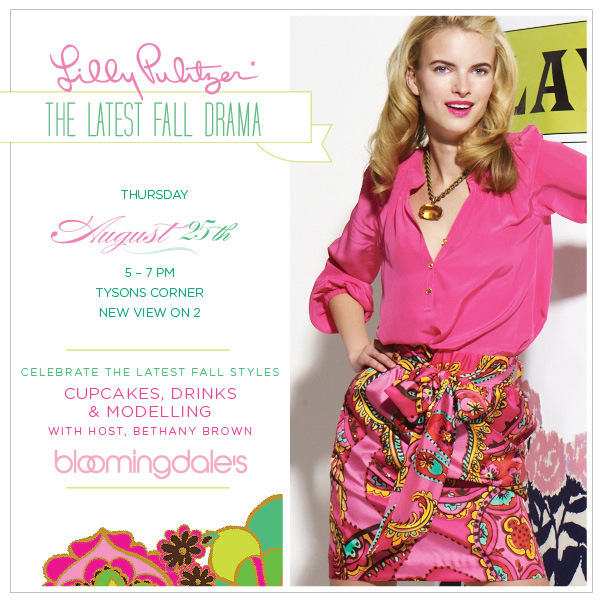 Join me tomorrow night at Bloomingdales at Tysons Corner for an exclusive fall preview event from Lilly Pulitzer from 5 p.m. to 7 p.m. Have you seen the new fall arrivals in person? You’ll have the opportunity to see an informal fashion show while you sip something sweet and enjoy a cupcake! While I was finalizing some last minute party details, I decided to try on some of my favorites. 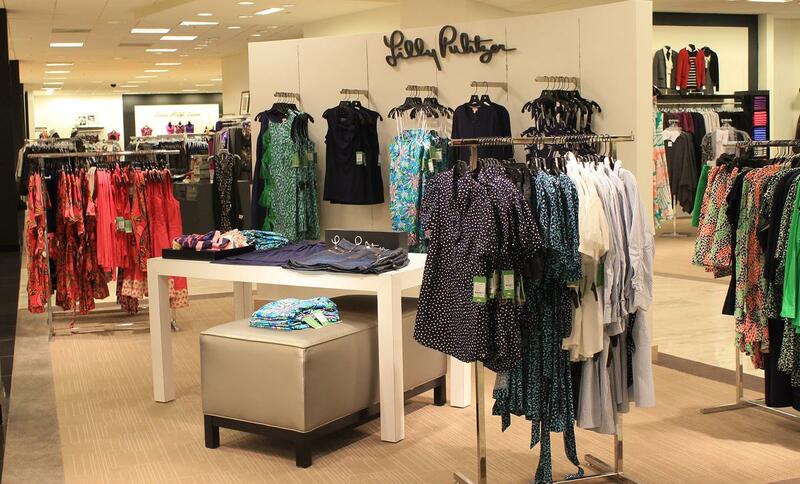 Here’s my take on Lilly Pulitzer fall with a fit guide to help you shop online or by phone. The Noelle shirt is sized numerically and fits true to size. The shape is feminine with a defined waist and is not at all boxy. 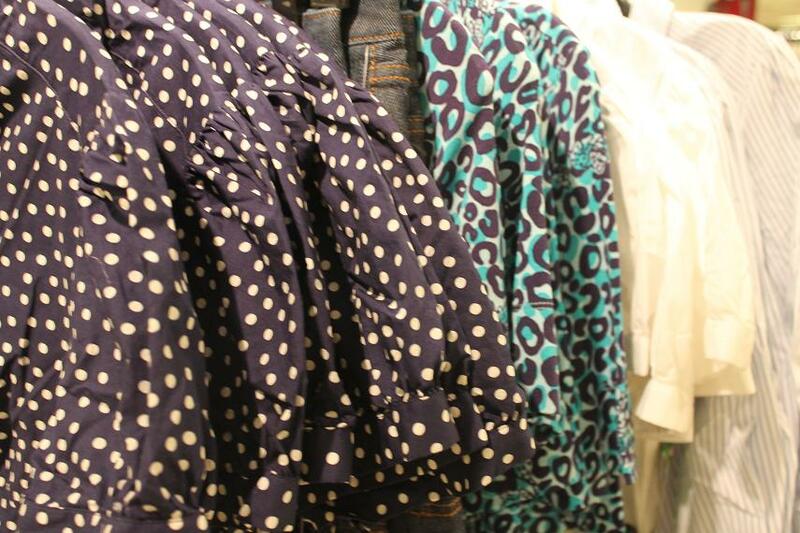 Perfect to wear now, the short sleeves fit neatly under a cardigan later. I’m 5’4” and the shirt hits mid hip. 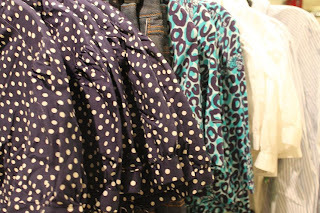 I love the polka dot print. The Adalie wrap dress is back for fall in three different prints. You’ll be pleased to know that all three prints are available at Bloomingdales in all sizes. The wrap dress is available in sizes xs-xl. I tried on a small and it fit perfectly. In my opinion, it’s fitting true to size. The empire wrap waist is very figure flattering and the self tie adjusts perfectly. Some wrap dresses cut too low in the front for my style, but Adalie is appropriate for work or play. This hits at the knee. The spandex jersey material does not wrinkle, making Adalie a good traveling dress. A printed tee is a fun way to add a pop of color and a whimsical print to your outfit. The Lexie crew returns for fall in almost every print pattern available. Natalia really likes the slubby cotton material, proclaiming that it is “very advanced t-shirt material.” It has a soft, almost silky feel to it. The Lexie is running a little bit small in my opinion; I would size up on this one. It's sized by letter. When a new collection is released, it's easy to pick my favorite dresses. But sometimes I overlook a winner! The Kearney wrap is a winner for fall. I want one in every color. The long sleeve wrap looks amazing over tees and has a perfect swing factor. Love this! I like the cutaway opening that is more like a Shere sweater than a bolero-type shape that other wraps have had in the past. This fits true to size and hits at the lower hip in the back and lower waist in the front. Thank you Lilly Peeps for a comfy wrap that does not make me look like a pink and green toreador with a missing backside! Now, here’s what you’ve been wanting to read…the fit guide for dresses. Let’s start with Vanessa. Vanessa fits true to size, but perhaps it is a little big in the hips. The bust and straps are true to size. It's a short little dress, cut just above the knee. Taller peeps may find it to be short. This dress is sized numerically. I’m loving the easy wear, no wrinkle ponte fabric of Vanessa. The empire waist is flattering to your tummy. 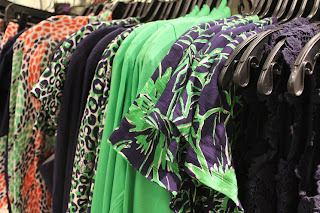 This print is gorgeous for early fall when you can still have 90 degree days, but want to wear a fall print. Seriously, you’re going to want to squeeze in the last days of summer with this dress. The Stephanie shift is also fitting true to size, although the shift dresses generally don't do too much to flatter my figure. I did notice that the length on the Stephanie shift is work appropriate, which is always a bonus. Sized numerically. In some seasons, I've had to size up in the Bowen dress. This fall, the dress is running true to size. While it's too short to be considered appropriate for work, even with a wrap, it's a cute dress for a date night. Sized numerically. You know what Lilly says, "Too much is never enough!" Well, I can't get enough of the Sadie dress. 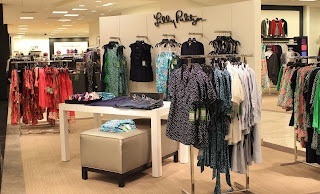 Back for the third season; Sadie is a Lilly fan favorite. I'm starting to sound like a broken record about the no-wrinkle factor, but this dress is so easy to wear. You'll look polished all day long and stay wrinkle free. My biggest pet peeve is getting wrinkled from a 10 minute commute. The rayon spandex jersey is uber comfortable - you'll be as comfortable in a dress as you would be in sweats. Seriously. Last year I liked the Brinkley shirt dress. This year I love the Christy shirt dress. Get it? Christy. Brinkley. Coincidence? 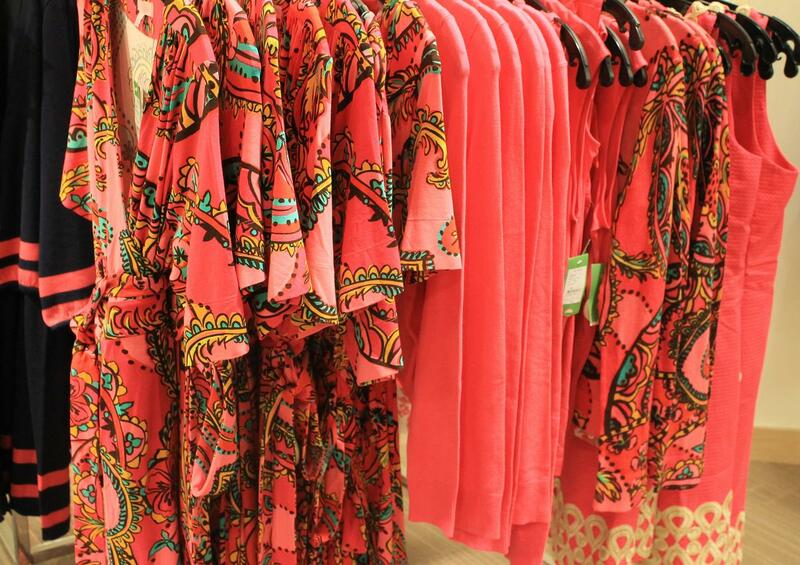 I don't think anything is a coincidence with Lilly and I love it! The numerically sized shirt dress fits true to size, although I do think that the tie waist was a little bit low for my petite frame. If you're average or tall in height, this will fit you perfectly. I ended up pairing the dress with the navy critter belt instead of the belt that came with the dress and loved the look. Please join me tomorrow at Bloomingdales from 5-7 for this fun Lilly Pulitzer event. There will be suprises and a fabulous gift with purchase. Although there is no need to RSVP, you can see more details about the event on the facebook page. I am actually planning on being there. I will look for you! !